The high cost and reducing abundance of wild salmon have caused the fish farming industry has grown rapidly since its introduction to the global fish market in the 1970’s. And while the reason for farming salmon may be economically sound, the main problem with fish farming is one that livestock farmers have had to deal with for years: disease control. Large concentrated host populations are perfect habitats for bacteria, and salmon farms are no different. A large amount of antibiotics are therefore used in the production of farmed salmon, and this creates a significant health risk to human beings. It has been proven in other fields of agriculture that the use of antibiotics in livestock feed has created antibiotic-resistant bacteria, and there is no reason the fish farm industry should be any different. The main antimicrobial (antibacterial) substance used in fish pens off coastal B.C. is oxytetracycline, part of the tetracycline group. In 1998 alone, 6.4 metric tones of oxytetracycline were used in fish farms off the coast of British Columbia. The tetracycline group is used for its abilities to ward off both gram positive and gram negative bacteria. Most standard antibiotics prevent growth of just one type of bacteria, and it is tetracycline’s ability to deal with a large variety of bacteria that makes it so popular. For other reasons, though, tetracycline seems to be a poor choice. Tetracyclines are not properly absorbed by the fish digestive system, and sizeable amounts are lost to the environment. This is why concentrations of tetracycline can be found in the sediment below fish pens. While livestock feed, including salmon food, makes up the majority of current tetracycline use in North America and the rest of the world, tetracycline is also one of the major antibiotics used in human treatment. Humans use tetracycline to treat a number of ailments from skin infections to stomach ulcers to infections of the urinary and digestive tracts. The reason people use the same antibiotics as livestock is because they are threatened by the same bacteria as livestock. And since the use of antibiotics in livestock has been proven to create bacterial immunities, this poses a real risk to human beings. This risk is also much larger in salmon farming than it is in other agriculture because of several unique characteristics of salmon farming. The antibiotic material lost through the fish effluent often ends up settling in beds of harvest shellfish such as clams and muscles. Also, it has also been found that several types of bacteria can transfer traits horizontally, meaning that if one type of antibiotic-resistant bacteria comes into contact with a group of antibiotic-susceptible bacteria, the group can quickly become resistant. Historically, the fish farms have been notorious for allowing escapee salmon from the fish pens, which then go and mingle with wild groups of salmon and spreading the resistant bacteria. 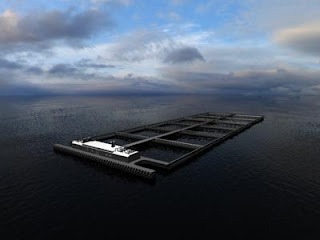 The practices of modern fish farms are far too dangerous to allow these farms to operate in the same manner. Places like Denmark have done tests and found it not only safer, but more profitable to reduce the amounts of antibiotics used in livestock production. Between 1994 and 2001, the elimination of antibiotics in feed (resulting in the increased use in treatment) in cattle has reduced the annual antibiotic use by 54%. This is not only safer and more responsible, but it financially outweighs the observed 1% loss in bull mass. These are numbers that should not be ignored by livestock farmers, especially those farming fish. And until antibiotic reduction techniques are put into place in the fish farm industry, people should avoid purchasing farmed salmon, choosing instead wild salmon. Ferber, Dan. (2003). Antibiotic Resistance: W.H.O. Advises Kicking the Livestock Antibiotic Habit. Science, 301(5636), 1027. Olson, Elizabeth. (2000, June 13). Antibiotic Misuse Turns Treatable to Incurable. New York Times, p. F2. Paone, Sergio. (2000, November). Farmed and Dangerous: Human Health Risks Associated With Salmon Farming. p. 4. Tofino: Friends of Clayoquot Sound. Zemelman, Raul, & Miranda, Claudio D. (2002, September). Bacterial Resistance to Oxytetracycline in Chilean Salmon Farming. Aquaculture, 212(1-4), p. 31-48. Misuse of antibiotics is quite widespread....disease-free fish mean bigger fish...bigger fish mean more money....easy to understand...difficult to accept!